....and apps can't help you to lose weight then I really don't know what can! Have you seen the wealth of apps and what not you can now obtain in your quest for fitness and weight perfection? Well let me tell you about some that I have got going on. Firstly, My Fitness Pal which is great for recording what you've eaten. Its free. It has all the brands, calories and what not and will tell you (based on your food intake) what you can expect to weigh in 5 weeks time if everyday were like today. I like that bit the best. It gives you hope! I also have the Map My Ride app - I love this one too and always use it out and about on my bike - it gives me great statistics - how fast, how long and how many calories I've burnt. 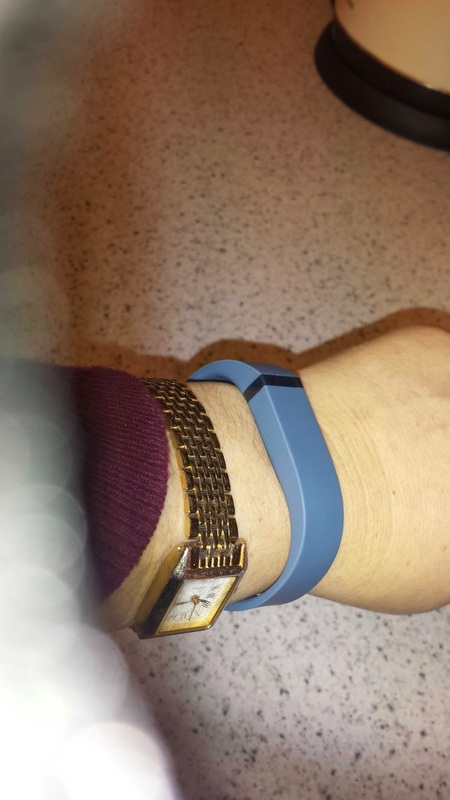 My latest addition to the miracle cure of all things fat is FitBit. I purchased a slate coloured one (not my preferred choice but it was down to £66 on Amazon) and it arrived today. Its easy to sync up to the computer and on my smart phone too. Its essentially a fancy pedometer - my one doesn't count stairs or I think cycling (mmm why have I purchased this?) - but it shows you fancy graphs and will tell me how well I've slept. So in the 6 hours that I have owned it I am liking it. I'm meant to be walking 10,000 steps a day and given that I have been indoors today I think I'm just shy off 5,000 which is a lot considering I haven't done much. I shall give you a proper review (no I didn't get a free one - boo hoo) in a few weeks. I do believe I can sync My Fitness Pal which records my food (the fitbit is American so all their food is American based) so will give me a much better calorie in take. Speaking of which I have lost 2lbs but given I put on 6lbs (that's a lot much more than last year but we couldn't get out it rained practically non-stop) nothing to be celebrated. I also have my Zaggora wear (which I did receive free to review) which I shoe horned on today, took pics and will give you the 14 day challenge result. My husband had the honor of taking the photos today so hopefully they will look better than my pathetic selfie attempts. The old fashionned fitness aid - a notebook. 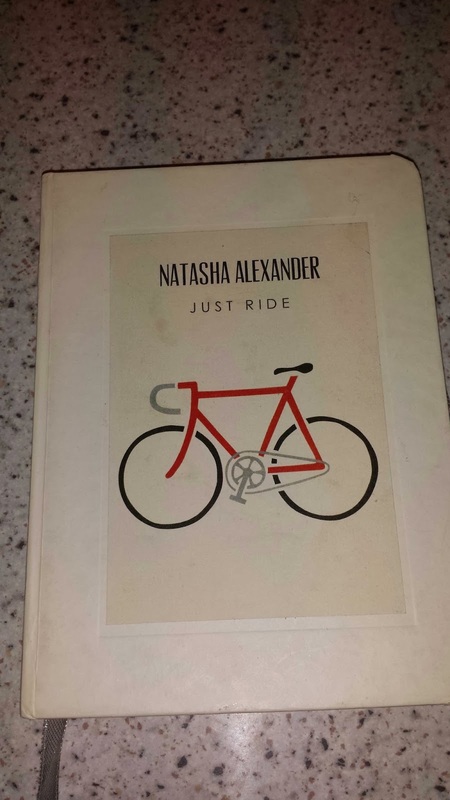 Its simple and to the point "just ride" - love it. Now another diet tool I received at Christmas is the least sophisticated of the lot. Quite simply its a notebook and a lovely one at that. My good and oldest friend Cath purchased it for me and it could potentially be the hands down winner of the lot. Who really needs all these gadgets and apps? Maybe we all need to go back to basics and just write down what we eat and what we've done exercise wise to keep us focused. There is a whole industry built on our desire to be fit and healthy. It used to be the weight watchers foods and the old guard slimming clubs but now its the app/gadget. Ultimately none of the above will work if the desire isn't there. I personally never start to re-focus on my diet on January 1st. I think its a stupid date to start any diet. You are still well and truly in holiday mode and have probably eaten and drunk lots the night before. There are still lots of left overs and the weather is generally dire. There is some talk on facebook of waiting until next week when all treats have been eaten. That's fine if you're not that fat but seriously you need to get going before that and if you do polish the left overs (of which there are lots here) then you will just increase your net gain. The kids are all back to school tomorrow. Yay! I decided to do my housework today - bad mother alert. I thought sod it I've done lots with them - farm, walks, woods, games, baking etc etc and whilst some will want to cherish the last day I want to have 3 hours to myself tomorrow. Genius I say. So tomorrow once buddy has been dropped off its pilates and weights and lots of faffing with my vegas photo album book. I have asked my friend Cath to write a guest post about her fairly recent exercise regime of running. You may recall she had a battle with breast cancer and the most positive outcome of this is that she implemented a training regime when previously she had none. I hope it inspires you as it does for me. Also my sister (yes you will be doing this!) is going to give us an account of her diet journey. My sister is overweight and has been for a long time. My other sister (her twin) gives her a hard time in a Sargent Major type of way (she is fit and healthy) and so far it hasn't had any impact. This time may be different I feel. I have heard of a few 40 something health scares recently. I think you can get away with lots when you're younger but as you head on up to 40 and beyond illnesses and what not do start to creep up. I think if you can get from 40-50 relatively health scare free then you're doing well. I think diet and exercise plays a huge part doesn't it? I don't want to have one to make me re-think what I consume. So lets crack the whip this year. I'm looking forward to continuing with the diet 1970's style. I'm going to post more pics this year just to give me some added pressure. So stay tuned for the Zaggorra challenge pics and I have a 40th party to go to on 25th - dress pics to follow! Thank you and yes there's always more gadgets!